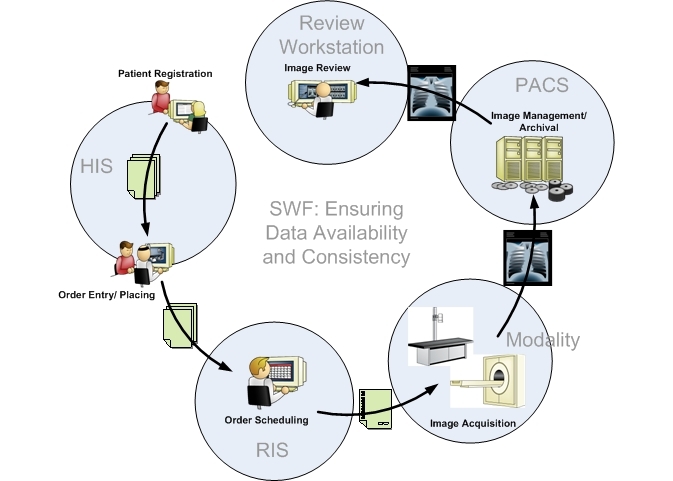 Scheduled Workflow (SWF) integrates the ordering, scheduling, imaging acquisition, storage and viewing activities associated with radiology exams. Scheduled Workflow establishes a seamless flow of information that supports efficient patient care workflow in a typical imaging encounter. It specifies transactions that maintain the consistency of patient information from registration through ordering, scheduling, imaging acquisition, storage and viewing. This consistency is also the foundation for subsequent workflow steps, such as reporting. Prevents delays in patient care by making relevant information available at the point of care. Minimizes "lost" studies by ensuring study identification and status is accurately tracked throughout the department. Establishes the continuity and integrity of basic departmental imaging data by profiling specific usage of HL7 messaging across multiple systems including: Patient registration (ADT), Order Placing (CPOE) and Order SCheduling (RIS) systems. Bridges the gap between HL7-based systems (like RIS) and DICOM-based systems (like acquisition modalities and PACS) within the radiology department by specifying the semantic mappings between messages. Maintains the consistency of patient demographic and ordering information across multiple systems by making that information available to image acquisition modalities via the DICOM Modality Worklist (MWL) Service. Ensures that acquired images are not inadvertently lost by specifying that the DICOM Storage Commitment Service is used to transfer the custodianship of images from the modality to the PACS. Ensures that the status of acquisition workflow steps are known throughout the department by specifying the use of the DICOM Modality Performed Procedure Step (MPPS) Service to convey that status from the modality to the RIS and the PACS. Vol. 2 - Sections 4.1 to 4.8, 4.10 to 4.14, 4.16, 4.18, 4.20 to 4.21, and Appendices A, B and D.
Vol. 3 - Sections 4.42, and 4.48 to 4.49. Patient Information Reconciliation [PIR] extends the capability of SWF by handling cases of unidentified (e.g. trauma), or misidentified patients. Cardiac Cath Workflow [CATH] - uses many of the mechanisms of SWF to integrate ordering, scheduling, imaging acquisition, storage and viewing for Cardiac Catheterization procedures. Nuclear Medicine Image [NM] specifies how Nuclear Medicine images and result screens are created, exchanged, used and displayed. Mammography Image [MAMMO] specifies how Mammography images and evidence objects are created, exchanged, used and displayed. Evidence Documents [ED] specifies how data objects such as digital measurements are created, exchanged, and used. Key Image Note [KIN] lets users flag images as significant (e.g. for referring, for surgery, etc.) and add notes. The Scheduled Workflow FAQ answers typical questions about what the Profile does. Scheduled Workflow Purchasing describes considerations when purchasing equipment to deploy this Profile. Scheduled Workflow Implementation provides additional information about implementing this Profile in software. This page was last modified on 25 May 2018, at 15:01.